Today at the Ottawa Bluesfest held in Ontario, Canada there was a catastrophic event as the main stage collapsed due to wind. On stage at the time was Cheap Trick and lined up to follow them were Death Cab for Cutie. Luckily no one was killed. 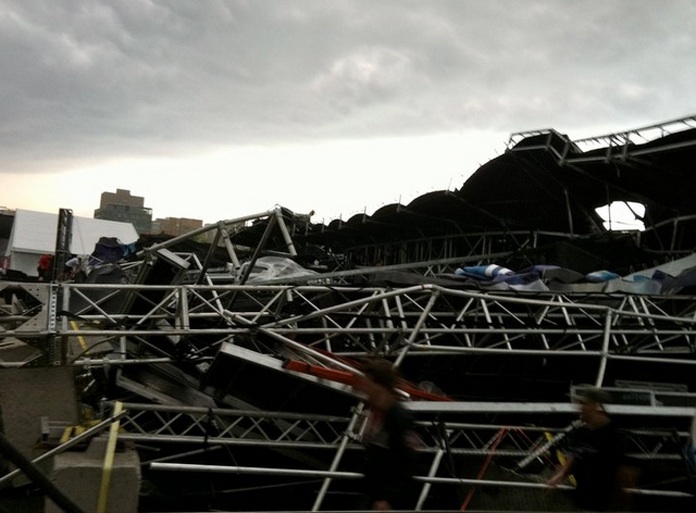 Death Cab frontman Ben Gibbard tweeted, "It was a miracle no one was killed today when the stage collapsed. Gear can be replaced, people can't." Death Cab bassist Nick Harmer tweeted, "Can only be thankful that stage blew backwards onto tractor trailers and not forward onto crowd. Still, awful to watch and hear." Cheap Trick had just stepped off the stage due to the strong winds and the stage crumbled within seconds. As the Globe and Mail reports, a few people have been taken to the hospital with injuries, and though most aren't critical, one man had a pierced abdomen and fractured pelvis, among other injuries. No people were trapped under the stage. All shows after the collapse were cancelled, but the artists still say they plan on playing at some point. Harmer tweets, "We will be back, we will figure out a way." Below is a fan shot video of the stage collapsing, via www.ottawastart.blogspot.com.